Whelk a spiral shelled sea snail called tsubu in Japanese is considered extremely delicious. Failing to remove its salivary glands may make you sick if consumed because it contains tetramin a toxic salt that can cause poisoning in humans. Tsubu is commonly eaten as sushi in many Japanese restaurants. The calories in Whelk per 25g(1peeling) is 22 calories. 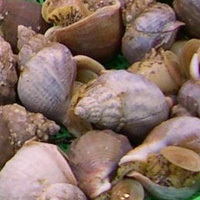 Whelk is calculated to be 86Cal per 100 grams making 80Cal equivalent to 93.02g with 4.45g of mostly protein、0.58g of carbohydrates、0.05g of fat in 25g while being rich in vitamins and minerals such as Vitamin B12 and Magnesium.